Neoaves is the sister clade to Galloanserae. Jarvis et al. (2014) show that it has two parts: Columbea and Passerea. Columbea contains about 3&half;% of the avian tree. The sister relationship between Columbimorphae and Mirandornithes in Jarvis et al. (2014) is not so suprising as they have been included in Metaves since it was proposed by Fain and Houde (2004). Jarvis et al. 's results make it clear that the original Metaves hypothesis does not hold up in larger datasets. It was in fact an artifact of using the β-fibrogen gene, particularly the 7th intron. Nonetheless, some of the signal was real, and Columbea remains once the Eurypygimorphae, Strisores, and Hoatzin have been moved elsewhere. Sharpe had earlier tried to establish such a suborder (Mesitides), but based it on the preoccupied genus name Mesites. I haven't been able to find uses of Mesitornis as a type genus earlier than Wetmore. Huxley (1868) first separated the sandgrouse as an order, using the name Pteroclomorphae, which modernizes to Pterocliformes. I follow Jarvis et al. (2014) where the mesites are sister to the sandgrouse, with the combination sister to the doves and pigeons. Hackett et al. (2008) also considered the three groups a clade, but with a different arrangement. Jarvis et al. also estimated that the divisions between the three clades date back to the early Paleocene. There has been some controversy about how to spell the family name. Although TiF has used Pteroclidae for a long time, back in 2010 both Pteroclidae (Clements, HBW, Sibley-Monroe) and Pteroclididae (AOU, BLI, Howard-Moore, IOC) were in general use, and even Pterocleidae had also been used. Since then, Pteroclidae has won the day. The name indicates it is known for its wing, i.e., “-cles” takes the same meaning as in names such as Heracles. By analogy with Heraclidae/Heracleidae, it would then appear that either Pteroclidae or Pterocleidae would be correct. Most importantly, the first is the form used by Bonaparte when he established the family-group name in 1831 (as the subfamily Pteroclinae), and is used here. The arrangement here is based on Cohen (2011). There's a bit of ambiguity in Cohen's results. According to the nuclear DNA, the Pin-tailed Sandgrouse, Pterocles alchata, is the basal species. However, mitochondrial DNA puts it sister to Burchell's Sandgrouse, Calopterocles burchelli, albeit with mediocre support. Because of that ambiguity, I've put Burchell's Sandgrouse in its own genus, Calopterocles (Roberts, 1922). Further, Pterocles is now restricted to the Pin-tailed Sandgrouse. Most of the wedge-tailed sandgrouse, with a long 10th primary have been of the former Pterocles species have been moved to Syrrhaptes, which is buried deep inside that clade. The other former Pterocles have been separated as Nyctiperdix (Roberts, 1922, type bicinctus). I have based the organization of the Columbidae on the paper by Pereira et al. (2007), which provides a comprehensive DNA-based phylogentic tree. Although the dodos and Rodriguez Solitaire (genera Raphus and Pezophaps) have been traditionally considered a separate family in the Columbiformes, the DNA says otherwise. Shapiro et al. (2002) and Pereira et al. (2007) found that these two genera are buried deeply within the Columbidae, in the Raphinae. The Reunion Solitaire seems to have actually been an ibis! See Mourer-Chauviré et al. (1995). The DNA testing shows three major clades. A basal clade includes a subclade consisting of the New World genera Geotrygon, Leptotila, Zenaida, together with a subclade of New World pigeons (including the Passenger Pigeon), as well as typical pigeons, cuckoo-doves, and turtle-doves. It is sister to the other two clades together. One of them consists of the New World Ground-Doves. The other contains all other doves. I rank the three major clades as subfamilies: Columbinae, Claravinae, and Raphinae. The name Peristerinae is sometimes used for Claravinae. However, this is incorrect as Peristerinae is based on the genus Peristera (Swainson 1827), which is a junior homonym of the mollusc genus Peristera (Rafinesque 1815). Thus Peristerinae is not available. The genus Peristera (Swainson 1827) was replaced by Claravis (Oberholser 1899). Todd (not Richmond) established the subfamily Claravinae in 1917, which he misspelled as Claraviinae (Dickinson and Raty, 2015). The arrangement of Claravinae is based on Sweet and Johnson (2015). As a result, the Purple-winged Ground-Dove, Claravis geoffroyi and Maroon-chested Ground-Dove, Claravis mondetoura have been moved to Metriopelia. The name Raphidae has often been used for a family containing dodos and solitaires. However, the dodos and solitaires turn out to be nested well within our subfamily Raphinae, and even deeper in the family Columbidae. The subfamily Columbinae has been studied in more detail by Johnson and Clayton (2000), Johnson et al. (2001), Gonzalez et al. (2009a), and Johnson and Weckstein (2011). Zenaidini and the species in Streptopelia and Columba, but not Patagioenas, have been rearranged accordingly. Although Johnson et al. (2001) argued that Nesoenas should be merged into Streptopelia, Cheke (2005) makes the case for instead moving the Malagasy Turtle-Dove to Nesoenas and distinguishing the Laughing and Spotted Doves in a separate genus. The results of Gonalez et al. (2009a) support this move. In the case of Nesoenas, both Nesoenas and Homopelia (type picturatus) have equal priority, being both named in the same work of Salvadori 1893. Cheke acts as first reviser, choosing Nesoenas. The Laughing Dove is the type of Stigmatopelia (Sundevall 1873) while the Spotted Dove is the type of Spilopelia (also Sundevall 1873). Cheke attempts to designate Stigmatopelia as the genus, but as John Penhallurick points out Schodde and Mason had previously (1997) chosen Spilopelia, so Spilopelia they become. 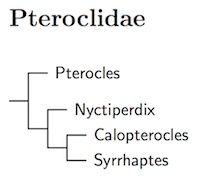 The work by Johnson and Weckstein (2011) showed that Geotrygon as usually constituted is paraphyletic with its members belonging to 3 separate clades. The Olive-backed Quail-Dove is sister to Leptotila. Banks et al. (2013) establish the genus Leptotrygon for it. The remaining quail-doves fall into at least two groups. Although Johnson and Weckstein did not include the type of Geotrygon (versicolor), a further analysis by Banks et al. (2013) included it and chrysia. The other “Geotrygon” form a clade sister to Zenaida. Banks et al. (2013) have now established the name Zentrygon for it (type costaricensis). The English names of White-faced Dove, Turacoena manadensis, and Black Dove, Turacoena modesta, have been changed to White-faced Cuckoo-Dove and Black Cuckoo-Dove to match recent IOC changes. There are also several splits. Based on Ng and Rheindt (2016), Sula Cuckoo-Dove, Turacoena sulaensis, has been split from White-faced Cuckoo-Dove, Turacoena manadensis. The remaining splits are based on Ng et al. (2016). Slender-billed Cuckoo-Dove, Macropygia amboinensis, has been split into Sultan's Cuckoo-Dove, Macropygia doreya, and Amboyna Cuckoo-Dove, Macropygia amboinensis. Bar-necked Cuckoo-Dove, Macropygia magna, has been split into Flores Sea Cuckoo-Dove, Macropygia macassariensis, Timor Cuckoo-Dove, Macropygia magna, and Tanimbar Cuckoo-Dove, Macropygia timorlaoensis. Enggano Cuckoo-Dove, Macropygia cinnamomea, and Barusan Cuckoo Dove, Macropygia modiglianii, have been split from Ruddy Cuckoo-Dove, Macropygia emiliana. The subspecies borneensis has been moved from Ruddy Cuckoo-Dove, Macropygia emiliana, to Philippine Cuckoo-Dove, Macropygia tenuirostris. Jønsson et al. (2011a) and Moyle et al. (2013) studied the Alopecoenas ground-doves and Gallicolumba bleeding-hearts. Jønsson et al. found that Gallicolumba was paraphyletic, and recommended splitting it into Gallicolumba (bleeding-hearts) and Alopecoenas (Australasian ground-doves). Their phylogenetic trees seemed to indicate there was still paraphyly even with the restricted Gallicolumba. The further analysis by Moyle et al. revealed issues with pseudogenes that were causing some confusion. Their results support placing the Crested Pigeon in the genus Ocyphaps. Finally, the three extinct Alopecoenas are most likely closely related to A. sanctaecrucis and A. stairi, and their placement reflects this. The Norfolk Ground-Dove, formerly Alopecoenas norfolciensis, becomes Alopecoenas norfolkensis. The old name had been supressed by the ICZN. The new name is due to Forshaw (2015). The Purple Quail-Dove / Indigo-crowned Quail-Dove Geotrygon purpurata, has been split from Sapphire Quail-Dove, Geotrygon saphirina based on SACC proposal #566. Sclater's Crowned-Pigeon, Goura sclaterii has been split from Southern Crowned-Pigeon, Goura scheepmakeri. See del Hoyo and Collar (2014) and Bruxaux et al. (2018). I have also adjusted the order of genera in Raphini based on Bruxaux et al. Gibb and Penny (2010) investigated the fruit-doves and close relatives. They confirmed Shapiro et al. 's (2002) result that Alectroenas and Drepanoptila are embedded in fruit-dove genus Ptilinopus. Cibois et al. (2014) concured in their more complete analysis of the enlarged Ptilinopus. Moreover, they were able to include most Ptilinopus species. The current arrangement of Ptilinopus is based on their results. They suggested a six genus treatment that retained Alectroenas and Drepanoptila. However, this may mean that Ptilinopus is not monophyletic, and it does not materially solve the problem of Ptilinopus heterogeneity. I do not recommend it at this time. The Black-banded Fruit-Dove, Ptilinopus alligator, has been split from Banded Fruit-Dove, Ptilinopus cinctus. Given present knowledge, it's fairly arbitrary whether to split or lump these allopatric forms. However, one is in Australia, the other in the Lesser Sundas, and the current tendency is for such forms to be split. Based on Rheindt et al. (2011a), the Maroon-chinned Fruit-Dove, Ptilinopus subgularis is split into 3 species: Oberholser's Fruit-Dove, Ptilinopus epius, Banggai Fruit-Dove, Ptilinopus subgularis, and Sula Fruit-Dove, Ptilinopus mangoliensis.